I'm currently translating a chapter of a manga (SERVAMP) and I only have a few dialogues left to finish it and while I was helped by someone, some particular lines left us confused and we haven't reached a conclusion. The verb 許す has been used a lot, mostly in the negative 許せない because the plot is about two guys and it's about revenge, thus "I will never forgive what you did" is said a lot (another common usage for 許す is "to allow", but I believe that "to forgive" is used in this context). That is the thing which I will take with me to hell. As you can see, a lot of 許す. I tried to break down every sentence、also forgive me for writing them in that weird way above. 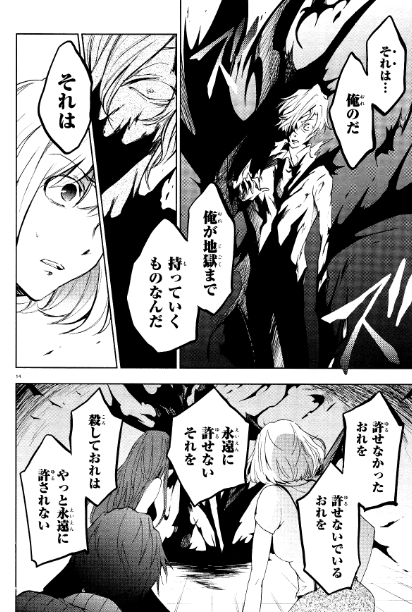 I wanted to better illustrate just how the lines are written in the manga speech bubbles, thus a total of 5 speech bubbles when the characters talks with 許す. 永遠に許せないそれを/ To me it sounds like the sentence is a modifier for それ, thus "The thing which I can never forgive"
And this is where I don't know anymore because　I don't know how to interpret the causative 許される. I get the feeling that here it would work with the meaning of "to allow". I'm truly sorry for such a long and most likely poorly explained post, I really did try to explain as much as I could. Anything would be of help! The first one can either mean "Me, who you couldn't forgive," or "me who couldn't forgive...,". Without any other sentence we wouldn't be able to tell which one it is because here the past tense of the verb makes it act also like an adjective (it qualifies the 俺). The second one can't mean "... of being able to be forgiven" because it is not a passive sentence here but an active sentence. But you're right on the rest of the sentence, it basically means "me who can't forgive...," (me who is in the state of not being able to forgive...,). Thanks to this one with いる that tells us that the performer of the action is actually 俺. It lets us know that the first sentence means "me who couldn't forgive...," and not the other one. And this sentence again confirms the fact that the performer of the action of 許す is 俺.
I understand it as: "I will finally not be forgiven for the eternity after I kill this thing which I can never forgive". I feel like maybe the 俺 is feeling guilty about something he did and doesn't want others to be forgiving him, so that's why he's thinking about killing "it". Me, who couldn't forgive それ,... Me, who can't forgive それ,... I will finally not be forgiven forever by killing this thing which I can never forgive. Sounds wordy but knowing so little about the context that's pretty much all we can think of... You can try replacing "forgive" by "allow" to see if it makes more sense to you. Not the answer you're looking for? Browse other questions tagged translation words verbs manga or ask your own question.